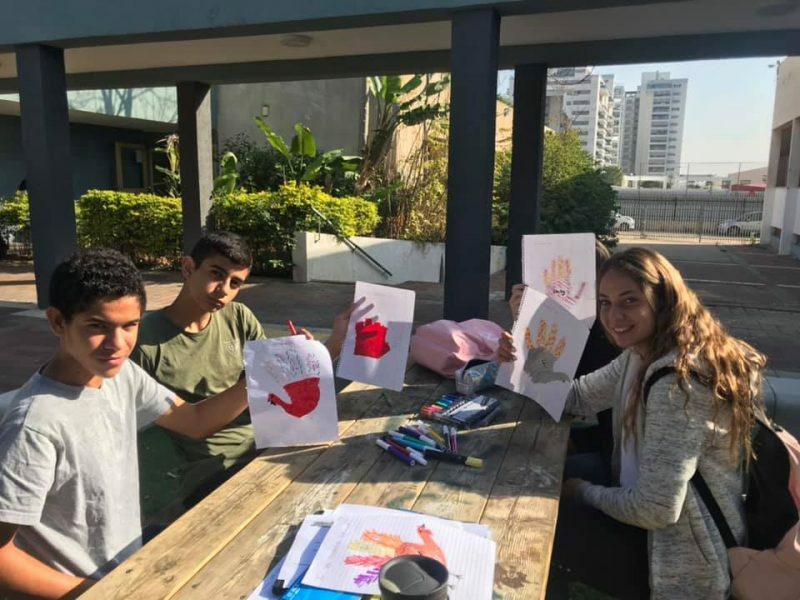 Students at Tchernichovsky School in Netanya, Israel participate in a lesson on Thanksgiving taught by the Jewish Federation’s Cincinnati Fellow in Israel, Shelly Zeiser. Shelly Zeiser, 26, is spending a year in Netanya, Israel as the Jewish Federation of Cincinnati’s Cincinnati Fellow in Israel, or Cincy Fellow. Shelly is an American emissary who is teaching Israelis about life, culture, and Judaism in the United States. While many cities, including Cincinnati, welcome emissaries from Israel to the United States, the Cincy Fellow program is the first to do the reverse, by welcoming an emissary from the US to Israel. Cincy Fellows is a Partnership2Gether program of the Jewish Federation of Cincinnati. Llama!!?? Llama!!!? If you spend a day in Netanya, you’re going to hear people yelling, “Llama!” It is not that Israelis have a fascination with the South American animal (though I must admit it does bring me joy to hear it so frequently); it’s that in Hebrew, lama (as they spell it) means “why,” and in Israel, “why” is one of the most constantly used words. Things are questioned, examined, and challenged by people who value curiosity, strength, and independence. Besides the joy I find at being able to yell about a fuzzy animal regularly, lama has quickly become my favorite Hebrew word. But lama?! Throughout my life, Simon Sinek’s method of leading with the why—using one’s sense of purpose to inspire and guide your work—has resonated with me. So it is no surprise that I would carry this mindset with me to Netanya. In each of my regular lessons at Tchernichovsky School or guest lectures at Sharet School or for tzofim (scouts), through volunteering at Volume and Koofsta teen centers, and even during random interactions at the shuk (market) or on the bus, I try to communicate the why behind American Jewry and not just the what. It’s not always easy. Often people see the what and get stuck. In one lesson on Chanukah in America, I showed pictures of traditions we have that don’t exist in Israel, such as Chanukah decorations, parties, ugly sweaters, and the Mensch on the Bench. The students often see these and think they are weird, foreign, or simply “not Jewish.” However, I try to push them to think deeper. Why do American Jews have a Mensch on the Bench? How would you feel if all your friends got a toy (referring to the Elf on the Shelf), and you didn’t, just because you’re Jewish? How would you feel if your school gave out Christmas cookies instead of sufganiyot? Would you eat a cookie? After all, it’s just a cookie… or can a cookie sometimes mean more? I try not to give them the answers but guide them to experience the emotions that come with being Jewish and living in the Diaspora. 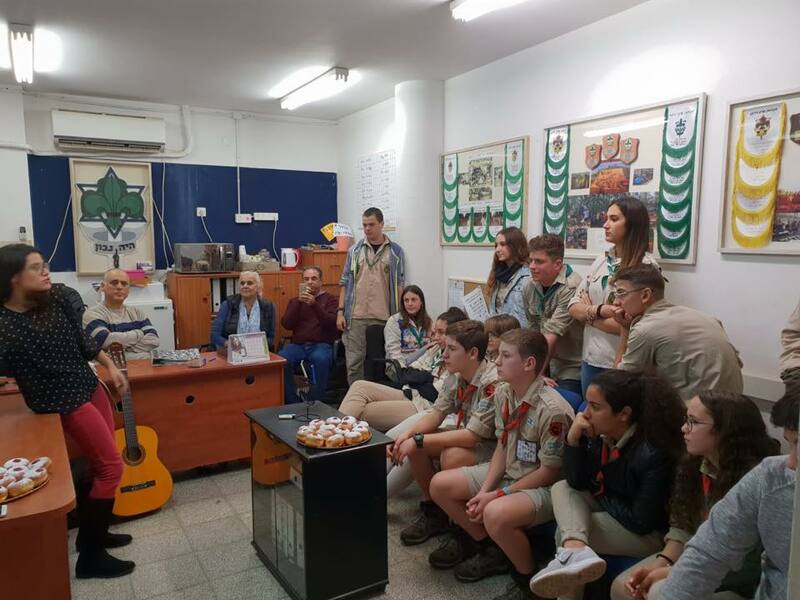 Cincy Fellow Shelly Zeiser leads a lesson comparing the celebration of Chanukah in Israel and the United States with a group of tzofim (scouts) in Netanya, Israel. In one class, a student actually provided the why for me. She moved to Netanya from Florida this summer and, completely unprompted, decided to share how it felt to experience Christmas each year as the dominant holiday and not Chanukah. She talked about loneliness, as she was the only student in her class not to get presents from Santa, and pride, as she got to eat gelt and play dreidel with her family. As her peers listened, I saw something change in that class because for the first time in my entire experience in Israel, no one asked “lama?” No one said anything. They just reflected. And in Israel, for an entire class to be quiet and not have questions, that’s huge. In October, I attended the General Assembly for the Jewish Federations of North America. The theme was Let’s Talk. While I know we still have a long way to go, I’m proud to say that in Netanya, we’re talking. We’re Looking for the Next Cincy Fellow! The Partnership2Gether program of the Jewish Federation of Cincinnati is still seeking its next Cincinnati Fellow in Israel (Cincy Fellow) for the 2019-2020 academic year. A good candidate is eligible for the Masa Israel Teaching Fellows program—between the ages of 20 and 35, Jewish, have a bachelor’s degree by September 1, 2019, and be a native English speaker—and interested in spending 10 months bringing American culture to and teaching English in Israel. Interested candidates should contact Sharon Spiegel, Community Building Manager, at sspiegel@jfedcin.org or apply here.